Jerry Jones had a plan five years ago: Build the Greatest Stadium in the NFL; Land a Super Bowl in Dallas; Construct a team good enough to play the Super Bowl in their own stadium. He got two thirds of it down, and coming into the 2010 season, it looked like he had a team good enough to complete his dream. Fresh off their most successful year in over a decade, the Cowboys were looked at as a team on the rise, and a team with a legitimate chance to play for the Lombardi trophy on their home field. Well…….. let’s just say that things veered off course, a little bit. The Cowboys entered the season on a high, and even after a tough loss in Week 1 in Washington, highlighted by the fact that the game-winning touchdown was negated by a holding penalty on a Dallas lineman, optimism was still high. Up until their home opener, which ended in a 27-21 loss to Chicago, the Cowboys were planted at the top of the Ticket Price Leaderboard. The average ticket price until Week 2 was $219.3. The Cowboys were not playing great football, but people were still paying to see good football. Then, through their next three weeks, up until their loss in Minnesota, which dropped them to 1-3, the average ticket price was still near the top of the rankings, at $209.8. After that loss to Minnesota, the bottom fell out. $209.8-to-$161.1-to-$122.8-to-$129.0. That price drop represents the average ticket price of each week from the week before the Vikings game, to the week before the Monday Night game against the Giants ($161.1) to the last two weeks. So far, the embarrassing loss to Jacksonville in Jerry-World did not do anything to the ticket prices. This is most likely due to the Cowboys’ ticket prices hitting near rock-bottom. There is not a lot of space for the prices to further drop. However, there is another factor at work here: The devastating injury to Tony Romo. The Cowboys were up 10-7 against the Giants. A win would have put them at 2-4, while the Giants would drop to 4-3. The Cowboys would be alive. Tony Romo went back to pass, and in the face of heavy pressure completed a first down to Jason Witten. The fans erupted, as the Cowboys were driving to extend their lead, but then those cheers shut up quickly, as the eyes looked back to Romo, who was on the ground, writhing in pain. Before the game was over, it was told to the public that Romo had broken his left clavicle. This was the nail in the Cowboys’ coffin. The season was over. Of course, no one knew the amazing depths that the Cowboys would fall, but the loss to the Giants, coupled with the injury to Romo, was the death knell to the Cowboys’ season and their ticket prices. The overall prices of Cowboys’ tickets alone paint a good picture of the injury to Romo. Before the injury, the team was still wildly disappointing, but their average ticket price was $201.9. 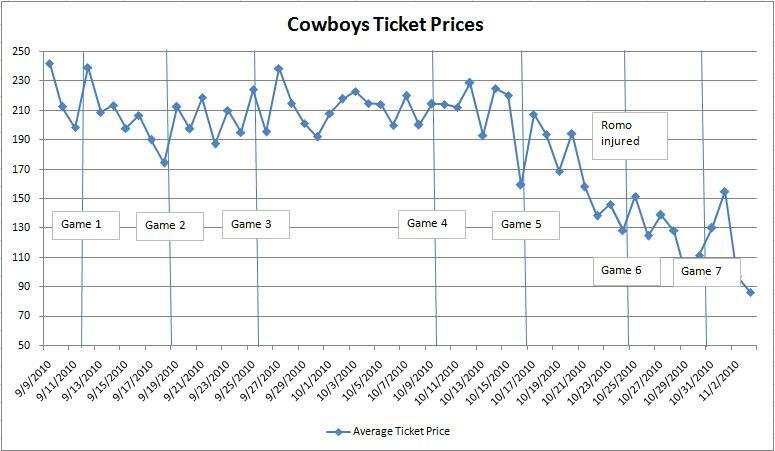 Since the injury, the average Cowboys’ ticket price has cratered to $124.4. However, that has other factors. 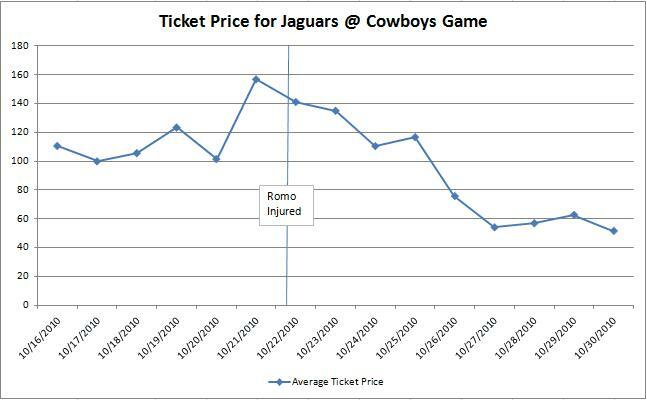 To isolate the impact of Romo’s injury, one way is to look at the prices of the tickets for the game following Romo’s injury, the 35-17 loss to the Jackosnville Jaguars. These are the ticket prices for just that game by day, and as you can see the Romo injury just killed the ticket prices. 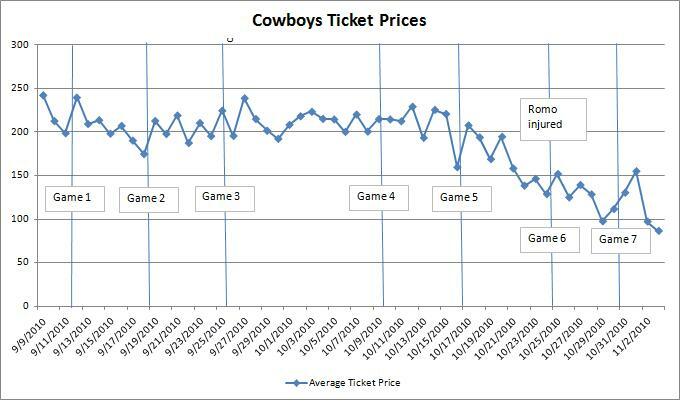 If you remember, earlier in the NFL Season we did a post where we examined how ticket prices of specific games increase as the game comes closer, so the prices in real price is worse that what is shown, as those nominal prices are boosted a bit by the game coming closer. Romo’s injury has a huge impact on the Cowboys’ tickets, but it looks like it has hit rock bottom. Even if they continue to lose games, it seems like the prices may not drop much further, as even a 35-17 loss to Jacksonville of all teams at home or a 45-7 loss on national television has done little to drop prices further. We’ll see if the coaching change has any positive impact, but for right now, the Cowboys on the field and off are at rock-bottom. Jerry Jones has to hope that this does not get any worse, but in the weird year of 2010, it just might. Thoughts and comments on the demise of the Cowboys? Leave a comment below or drop us a tweet @SeatGeek.